5. We do not have a Refund Policy, if we had deemed your program to be detrimental to our reputation, your payment will be considered as a Listing Reservation Fee for your next reasonably schemed program. 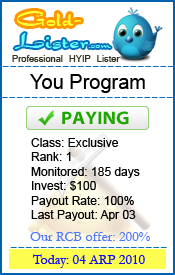 * PAYING * - we are regularly receiving payments from your program without any problems. * WAITING * - program is newly added and no payment made yet; withdrawal is pending because program is offline for maintenance or script update. *PROBLEM * - we have 2 or more pending withdrawals; site is inaccessible for some days; with verified reports of unpaid investor/s even if you are paying us, cases of selective payments. * NOT PAYING * - we have not received payment for 2 or more withdrawal requests made within a considerable time span; with verified reports of unpaid investor/s. 7. If you find that the listing which you have submitted before is not listed on gold-lister.com, please do not re-submit it again. Check that you have already made the initial deposit amount and contact us via our support form if you have any questions or require any assistance. 8. If you agree on these conditions, please proceed on listing your program below. * It is initial deposit amount. It will be redeposited all the time in your program. It is important part in our program ranking - higher initial deposit means higher position of program in our ranking. You can specify any amount there, but $25 for Trial listing, $60 for Normal listing, $120 for Premium listing and $200 for Exclusive listing are current minimums. Example - if you buy Exclusive listing, but want to get more exposure for your program, you can fill $200 as initial deposit amount. Then listing price will be $210 (with fee) and $200 is redeposited back in your program all the time. Maybe you will ask yourself and me one question: Why advertise with us ? Solid Bank - our Invest Deposit over $19000 within 17 days. Oil Gold Money - our Investor Deposit over $14700. 1. 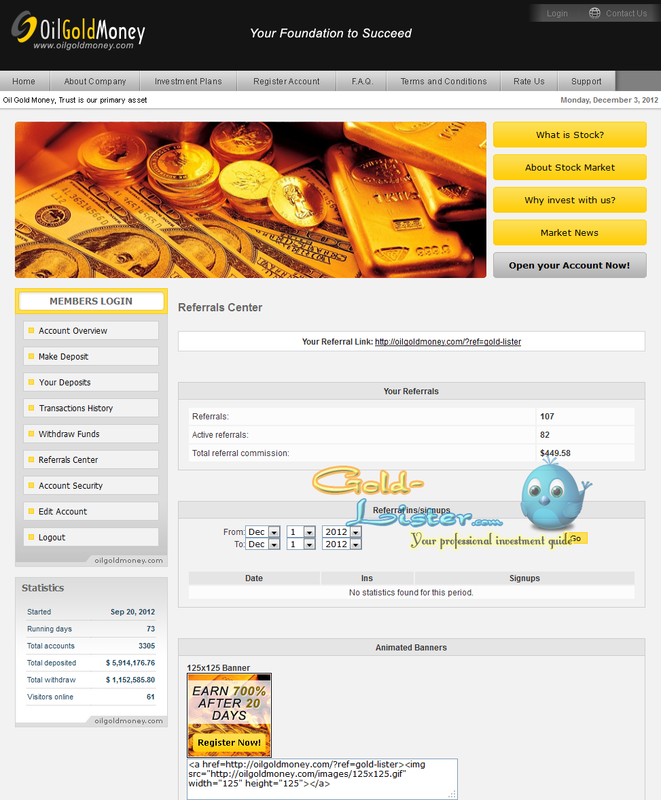 Choose payment system and pay the "Listing Fee" by clicking below button. 2. 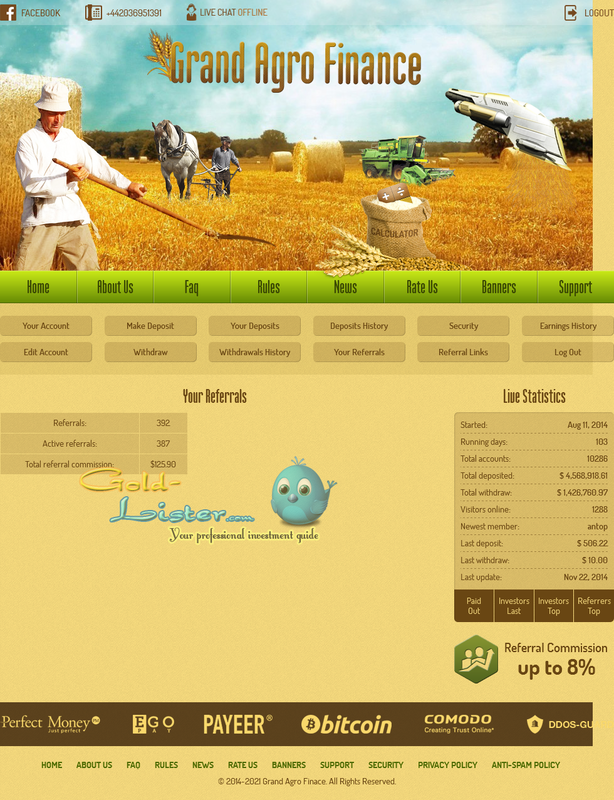 After success paid, you will redirectly to "add listing" form. Fill form and submit for listing.